The Auditor General reports that both of these stations originally fell into the “Not Recommended” category, and this is the position management originally took to the Minister of Transportation and to the Metrolinx Board. In the case of Kirby, the Minister wanted this station and issued a press release saying it would be included in Metrolinx plans even though management had recommended against this. Lawrence East was a different situation where the City of Toronto wanted this station as part of the SmartTrack scheme. In both cases, the evaluation methodology was changed to shift the stations into a category that was recommended, albeit with very poor performance expected. Care had to be taken to craft changes to the methodology so that only these two would slip through without elevating other poor-performing stations to a marginally acceptable level. The AG makes the point that a mechanism exists for a Ministerial directive that Metrolinx include stations that do not make the cut in its analyses, but that this would be done with the clear responsibility in the Minister’s hands. It should not be Metrolinx’s job to cook the books so that a favoured project looks better than it really is and provide cover for a political decision. This is a fine idea in the abstract, but the reality of government is that politicians do not want to appear to “waste money”. A staff report saying “your pet station isn’t worth building” is hardly the sort of ringing endorsement Ministers want to have. This is not just a provincial problem, but a general issue across governments where a negative evaluation of any project will never see the light of day, barring a “brown envelope” leak to the media. Positive staff reports are routinely used to give projects an aura they do not deserve, a stamp of respectability from “professionals” who claim to have carefully reviewed and endorsed them. At the City of Toronto, the experience of a former TTC Chief General Manager who opined that the Scarborough Subway Extension was not a good idea led to a new verb in civic discourse: to be “Webstered”. He retired somewhat sooner than expected. 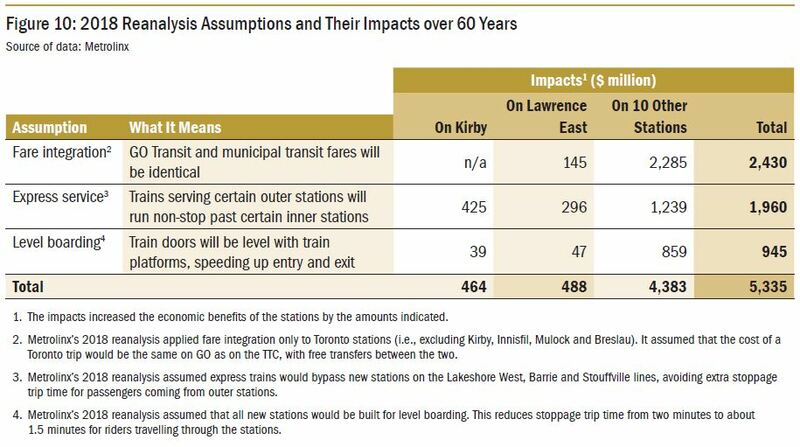 Metrolinx’s response to the influence was to make the Kirby and Lawrence East evaluation results look better. Metrolinx’s 2016 original business-case analyses of the Kirby and Lawrence East stations noted that both stations were expected to result in a net loss of GO ridership, a net increase in vehicle use (driving) in the region and an overall decrease in fare revenue. The business-case analyses did note positively that the stations aligned with municipal land-use policy, which slightly improved their evaluation results, but they still concluded overall that these stations were “low-performing” and “should not be considered further during the next ten years.” However, the Metrolinx Board Chair and Chief Executive Officer guided the process whereby the Metrolinx Board ultimately supported the decision to add these two stations. When the AG talks about the CEO’s role, it should be clear that this process includes the term of Phil Verster who became CEO on August 24, 2017. In a conversation at a recent Metrolinx Town Hall, Verster claimed that the Kirby Station issue was “before my time”. This is true only to the extent that Ministerial interest in Kirby Station dates from mid-2016 (see chronology on p. 297), but the work to massage the recommendations and defend them to the media and public extended into 2018. One problem with Metrolinx’s multiple factor evaluations has been that the relative importance of each factor is unclear. an annual loss of over $900,000 in fare revenue. An argument can well be made that Metrolinx overvalues the effect of additional station stops on ridership. The effect is probably a non-linear one where small changes will not discourage riders, but larger changes would. There is a general problem with the evolution of GO Transit in that its role is changing to serve more close-to-downtown locations as this will affect travel time for long-distance riders. Metrolinx plans to offset this with a combination of express trains and electrification to reduce the penalty of station stops. However, the original forecast made no assumptions about these possibilities and showed a negative value leading to a “not recommended” status for Kirby. The corruption of the process began in June 2016. The first attempt to improve the numbers involved the use of express trains to ensure that riders from beyond Kirby Station would not be affected by its addition to the line. This did not solve the problem, as the CEO noted in an email. Subsequently, events at the political level dictated Metrolinx’s actions, including those of its supposedly independent Board. Before our June 28 public board meeting, the Minister and Mayor Tory want to make an announcement about the Smart Track stations Mayor Tory will be recommending to Council. They want this to be a positive announcement reflecting City-Province-Mx [Metrolinx] cooperation. We did not want the Minister doing so without the input of the board in advance. To permit the joint announcement and preserve confidentiality, we agreed to this special meeting. We will then revisit the same issues in public session on June 28 but by then, it would be too late to do other than approve the staff report. Thus the real substantive meeting is this one on Wednesday [June 15]. Staff got to work figuring out how to justify new stations. The first change was to move the dividing line between “recommended” and “contingent” stations from an economic cost of $250 million to $300 million. This allowed the Don Yard project to shift into the “contingent” group. However, this tactic would not work forever because the line would have to shift to above Kirby’s cost of $478 million, and this would bring other unwanted stations into the “contingent” category. To get around that problem, Metrolinx split the “not recommended” group into “low-ranking” and “very-low-ranking”. Those “sensitivities” no doubt included the political aims of the Minister of Transportation and the Mayor of Toronto. In March 2018, Metrolinx published its Draft Business Case Guidance, which states that business cases are only one of five inputs Metrolinx considers in decision-making. […] Metrolinx considers public engagement, policies and other investments, emergent trends and conditions, and capacity to deliver in addition to business cases. Based on our review of the process which led to the approval of Kirby and Lawrence East stations, a sixth input—stakeholder influence—was also an important input in Metrolinx’s decision-making. Repeatedly adding further “strategic considerations” to the decision-making process makes it possible to justify any decision. Similarly, putting so much priority on these vague strategic considerations—and less weight on net economic costs—makes the decision-making process seem arbitrary. This is especially concerning because it resulted in Metrolinx choosing just those two stations that the Minister and the City of Toronto influenced it to choose. Metrolinx’s Board Chair recognized this in a June 13, 2016, email to other Board members. At this point, Metrolinx was expecting to recommend just the 10 stations and not Kirby or Lawrence East. This is precisely the problem with the naïve idea that a government organization can maintain a veneer of professionalism under political pressure. When the “political burden” of justifying a decision that goes against professional recommendations lands on a politician, they will quickly find a way out. If the organization tasked with providing advice does not or will not say what is expected, there are always willing consultants whose opinions can be procured to support any position. A year later, Metrolinx was still brewing up a new analysis to support political demands, and incorporated substantial changes including a blatantly distorted value in the economic analysis. These are summarized in three figures from the AG’s report. “Fare integration” has been the holy grail of much planning at Metrolinx over the years both as a political imperative (reducing cross-border penalties) and as a way to boost ridership. The fundamental political problem has always been that either subsidies must rise to offset the foregone revenue, or somebody’s fares must rise so that other’s fares will fall. The latter was a zero-sum exercise that hobbled Metrolinx planning until a point where the need for some added subsidy was recognized. This was announced in the short-lived budget of the Wynne government, but there is no reason to think it will survive into the Ford era. Even the proposed “integration” was only for 50% off the full adult fare with less for seniors and nothing for passholders who constitute the largest block of TTC riders. Cheaper fares attract more riders, and any part of the cost/benefit analysis will be affected through related metrics including time savings, reduced auto use, and so on. It is not clear whether the financial impact includes the lost revenue through reduced fares which would only be partly offset by more people riding. Express service reappeared as part of Metrolinx’ plans in the February 2018 report. Previously it had been rejected as part of service designs for most corridors because of track limitations (the ability of express trains to bypass locals) and the problem that “local” stations would have infrequent service. This bumps into the service levels and ridership claimed for SmartTrack where a train every 15 minutes will not provide “rapid transit” service within Toronto thanks to longer transfer times. There is some debate about whether a mixed express and local operation is possible on all of the SmartTrack corridor because of right-of-way limitations for passing tracks. The service design still shown by Metrolinx for the Stouffville corridor has a mix of express and local trains with 20 and 15 minute peak headways respectively. Notable by their absence from the map are the SmartTrack stations including Lawrence East. It is a mystery how the contractor for the new stations construction could possibly be responsible for solving the infrastructure problems of express operation. GO is already in the process of expanding trackage in the Barrie and Stouffville corridors, and anything beyond what is now underway would be an add-on that might not be compatible with what is being built. Moreover, the ability to use passing tracks is closely tied to service frequencies, stop spacing and schedules so that express trains overtake locals at precisely the correct time to pass them without being delayed. As local stops are added to a route, this becomes more difficult until a point where a dedicated express track is essential. The Benefits Case Analysis for the GO Expansion program shows considerably better service on the Stouffville corridor with trains inbound from Lincolnville every 20 minutes running express south of Unionville overlaid on a local service every 7.5 minutes from Unionville south. It is unclear how this could be operated, especially with the additional SmartTrack stations (also missing from the Expansion BCA), without a dedicated express track. One cannot help thinking that Metrolinx continues to engage in wishful thinking to achieve political objectives. Level boarding would eliminate the step up to GO train entrances from the platform and speed loading. This would save on stop service time, but it requires changes to all platforms with potential operational impacts especially where corridors are shared with freight trains, not to mention for express GO trips that would pass the platforms at speed. The business case document for level boarding might well have been available to the AG, but it is not posted on the Metrolinx site (notably it is not on the benefits case page). In estimating savings to motorists who would no longer drive to work, Metrolinx used the fully allocated cost of car ownership rather than the marginal cost of operation. This presumes that a commuter could reduce their car ownership, but that is only possible if they have reliable, convenient “last mile” access to transit service. A parking garage at Kirby Station does not qualify, and the need for a car, if only for a park-and-ride trip, would remain. The value of time saved has always been a contentious issue in Metrolinx analyses because it forms one of the largest paybacks against the investment in infrastructure and better service. By escalating the value of time, the analysis offset the discounting of future costs and revenues so that “time saved” in the future was worth more proportionately than it would otherwise be. This is particularly important with a 60-year time horizon where, normally, future costs and savings would have only a small effect on the net present value. December 2014 is well before any of the work under discussion here had begun. Collectively these changes made a big difference in the “performance” of new station proposals, but the problems do not stop here. What the report lacked was “sensitivity analyses,” which would have presented a range of estimates about the economic benefits of the stations if, for example, any of the initiatives were not implemented or were implemented differently than assumed under the best-case scenario. Metrolinx did undertake such sensitivity analyses internally, assessing how the estimated benefits of each station changed with the addition or removal of each initiative. However, it did not include a range of possible benefits in the report published for stakeholders and the public. The Auditor General’s report is unquestionably clear that there was an abuse of process at Metrolinx right into 2018 to convert a negative recommendation to a positive one, and that this was done at least with the knowledge if not the active participation of the Board. Metrolinx plans to improve its processes, but this comes just at a time when political meddling will grow substantially with a government that knows what it wants to do and will not brook criticism. This entry was posted in A Grand Plan, GO Transit, SmartTrack, Transit, Urban Affairs. Bookmark the permalink. Bill R said: Metrolinx was asked to provide the assumptions and details how the Metrolinx station riderships were arrived at. Ridership is greatly affected by frequency. They were asked to supply frequency assumptions. At the public meeting, the whole audience asked for an answer, no response. Steve said: Yes, I was there and was appalled by the evasiveness of the answers and sense that the people sent by Metrolinx knew only the basics, not the details that anyone with a sense of the politics of Scarborough transit would reasonably expect to come up in questions. Of course if the idea is to minimize the info the public actually gets, then sending someone who barely knows the portfolio is the way to go, but it insults the audience by wasting their time. The whole point of “let us get back to you” answers is to remove the controversy from the public forum and a supportive audience. The AG shows no examination of ridership! ”The overall conclusion of the business-case analysis was that the “area’s low employment and population densities and limited real estate market demand “”. Note this is actual TTC data. We are not dealing with errors in ridership forecasts. Reputable forecasting models use as much actual data as possible. I was told Metrolinx uses a survey and Statistics Canada census data from the last census, as base data, not TTC data. From the Metrolinx Technical report for the Lawrence Station, you can see Metrolinx fudged estimates were 9.200 passengers on 15 minute headways. The RT has 10,500 passengers on 4-5 minute headways. It is not possible to increase traffic by reducing frequency. The error is that Metrolinx did not take into account bus and transit utilization of the Lawrence station, solely the walk-in catchment. The City required a replacement for the Lawrence RT station, a factor Metrolinx never considered. The AG clearly missed the boat. Steve: Many of the ridership estimates for various Scarboro corridors and services are polluted by the constantly changing mix of service frequencies and stopping patterns on GO/ST, subway alignments and stations, and of course the now-discarded LRT route. I don’t believe any of them, and I particularly don’t believe any of the so-called professionals who fronted for these projects at various public meetings. I don’t think that the AG missed the boat, and she described in great detail the machinations around the change in Metrolinx official stance on the worth of the two stations. That is what she was asked to do, not look more deeply into Metrolinx (and City) ridership estimates. SMART (The California commuter that uses the same DMU trainsets as Union-Pearson) uses high level platforms with a gauntlet track (A second set of tracks parallel to the platform tracks, shifted by a couple of feet) for freight trains. Steve: This is workable provided that there is enough spare room in the corridor to accommodate the extra track separation at stations. Lawrence East is a tight spot already without a few extra feet on at least two tracks for clearances. Please keep in mind that the political interference mentioned in the auditor’s report was committed by the Liberals. Under the Liberals, we had multi-billion dollar scandals and bribery scandals and what not but not even a single corruption scandal under the Progressive Conservative government. I am no fan of Doug Ford but I appreciate that Ford governs ethically and honestly. Steve: I was going to say that Ford hasn’t had time yet, but then thought of the Hydro One fiasco, the fire sale of the Hearn site to a political friend, and the machinations to ensure that a friend of the family got to take over the OPP when he was not qualified until the government changed the rules. Then there’s Bill 66 which includes provisions such as those related to the Green Belt directly contradicting campaign promises by Ford himself. Ethically and honestly? Ford does not know the meaning of the words. All he knows is bullying and bombast and taking care of his friends. Of course any historical review will reveal Liberal problems, but I hope the AG still has enough real independence in coming years that she will be able to light fires under the Tories’ feet too. My purpose in writing this article was to show the degree of Metrolink collusion in this practice which demolishes their often-polished reputation for being an impartial source of information about transportation planning. They will cook reports for Ford just as they did for Wynne and for McGuinty before her. Or they will find themselves out of a job. You might want to be more worried about the people still inside Metrolinx who helped create this mess for and under the protection of the not-so-sadly-departed Liberals. These Grit grifters are still in full sway, along with recently-arrived, Liberal-friendly consultants, including the one who brought us the Glen Murray high-speed rail fantasy. Their names never appear on the documents presented publicly at those MX “bored” meetings, but their fingerprints are clearly visible to those of us who know what’s going on inside that shop even still under a new government. But please don’t worry about these many “poor” denizens of the Sunshine List at Metrolinx and MTO. I hear they all come from tightly-knit families in hard-scrabble neighbourhoods, so they should be able to easily make those breathtaking paradigm shifts in their careers and personal lives. Did I mention the thoroughly rotten safety culture that developed at Metrolinx under the Grits? The daily TSB safety filings, which aren’t available to the general public, make for some horrific reading. Ponder such death-defying goodies as CROR Rule 42 violations and “exceeding the limits of their authority.” You can then multiply those “oopsies” a few times over each week and sometimes even within the course of a single operating day. Gosh! I have NEVER known a country and a government SO INDECISIVE about getting its public transport into the modern age of much larger subway systems and high speed train service like Europe and the U.K. than Canada. When it comes to spending money on public transport, Canada is at the bottom of the list with a government that just doesn’t care!!! I wish to reiterate this. In a public session where the whole audience asked for an answer, Metrolinx refused to answer a basic ridership question. There is absolutely no accountability of Metrolinx to the passengers, only to their political master. The citizens require public transit. There is not enough money to do all projects. It is reasonable to ask that decisions be made in an evidenced based manner. Politicians don’t agree, they believe whoever has power should make the decision. Government staff like Metrolinx and the AG are failing the citizens. We get the government we deserve. Steve: There is a devastating Twitter thread by Ben Spurr tearing apart Steven Del Duca’s self-serving op-ed in the Star. Gordon Keith said: SMART (The California commuter that uses the same DMU trainsets as Union-Pearson) uses high level platforms with a gauntlet track. This is another example of politicians using their power to override common sense. Tory’s SmartTrack uses GO trains, railroad coaches with two steps to track level and two doors per car. A DMU (or EMU) has high level platforms and multiple doors to significantly reduce station dwell time. Being lighter, the acceleration time and more importantly the deceleration time is much reduced, making service faster. A sensible SmartTrack would incorporate the Union-Pearson line in the West and build two dedicated DMU tracks in the Stouffville corridor (replacing the SRT) and traverse King Street to skip Union Station. Politicians are not transit experts, yet get to waste tax payer money on impractical fantasies. I think we have some competition. Perhaps, however the existing RT connection does not go anywhere of note, whereas the RER alternative would provide a substantially faster transit route to the financial district. Connecting people to very meaningful employment destination may have the potential to offset the loss due to frequency. So there is doubt about your assertion. Steve: The assertion of a faster trip depends on two factors. First is the frequency of service which, depending on which fictional account from Metrolinx one reads, could lead to non-trivial waits for connecting service. Also, the proposed transfer connection at Lawrence East Station to the bus feeder route is considerably less convenient than what is now in place, and this will add to the transfer penalty. Many who have jobs in the core are not bound for the immediate area around Union Station, and the time to transfer and double back must be included in the total travel time. Be careful what you assume about “faster” travel just because one link in the path appears to be better. For some it will be, but not for everybody. Generally when it comes to transit projects there are serious problems quantifying value and cost. Deloitte concluded that the TTC’s project cost estimates have a long history of containing critical flaws that lead to serious doubts about the reliability of their cost estimates. There are a lot of good reasons to question most project valuations. The problem for the AG is quantifying the value of a project where a noteworthy portion of the value is intangible. So regarding your conclusions based an overly simplified estimate, it is at best questionable. Steve: One must also consider the political imperative to lowball cost estimates so that projects don’t seem too daunting and funding can be obtained based on the original estimate. This applies to the Line 1 signalling project and the Scarborough Subway Extension, to name two. Locomotive hauled coaches, DMUs and EMUs can be built with either high level loading or low level loading. The problem with putting more doors is that it reduces seated capacity while improving loading time. A trade off has to be made between these two. Verster wants all, or most, GO station platforms to be at the level of the accessibility platform and go out to the edge of the car. This makes sense because it improves service with the existing infrastructure while high platforms would require a very costly do over of all affected stations. The south platform at Bramalea station, track 4, was close to being finished then was almost completely torn out. Since then there these square pillars appearing all on the platform that are about the height of the accessibility platform. Does anyone know the official reason for this? My supposition is that they are using this as a test of Verster’s plan since this track will never see freight trains. Steve: Also, the proposed transfer connection at Lawrence East Station to the bus feeder route is considerably less convenient than what is now in place, and this will add to the transfer penalty. The problem with the Lawrence East station is it was designed to fail. If it was designed properly it would have the potential to be a worthwhile asset that serves the community. Although it is taboo these days to talk about parking lots, Lawrence East has access to the hydro field and can build a parking lot similar to the one at Finch and Yonge which functions quite well. As much as we need to build transit oriented communities, we must also respect communities that cannot easily transition to a transit only life style. If the station is to be successful it needs to be designed to be aligned with the underlying needs of the community. Unfortunately the current design is not. Steve: Do you understand that the new Lawrence East SmartTrack Station will work completely different from the existing RT station? Instead of looping down to track level, the buses will stop at the crown of the bridge, and there will be stairs/elevators to take riders to and from the ST platform. There is no provision for access from at grade facilities such as parking. This is what passes for good station design. However, as for transit oriented lifestyles, there simply isn’t enough space beside any station to handle riders arriving by car at demand volumes beyond an am peak inbound. This is the problem GO faces in trying to move beyond a commuter peak into downtown. Jon Johnson said: the Lawrence East station is it was designed to fail. City planners made the decision to replace the Lawrence RT station with a SmartTrack Station and not include a subway stop on the Scarborough subway extension. The public registered their objections and concerns and vigorously and actively participated in the consultation process. The current RT frequency is 4-5 minutes, it is single TTC fare and it has a safe convenient transfer from bus to RT. SmartTrack requires a $1.50 fare increase, has far less frequency and a far more encumbered transfer path. The record shows that the SmartTrack team did not honour any of their objectives – integrated fare, useful frequency of train service, viable replacement of the RT station, incorporate public feedback and even failed to provide modeling statistics based on 6-10 minute service and a incremental fare of $1.50. Steve: Instead of looping down to track level, the buses will stop at the crown of the bridge, and there will be stairs/elevators to take riders to and from the ST platform. There is no provision for access from at grade facilities such as parking. This is what passes for good station design. This is why I am saying that the Lawrence East station is designed to fail, because I agree with what you said earlier. Steve: … the proposed transfer connection at Lawrence East Station to the bus feeder route is considerably less convenient than what is now in place, and this will add to the transfer penalty. The goal should be to reduce the total time some of take to get to and from the station, not to increase it. The station needs to be redesigned if it is to succeed. Steve: However, as for transit oriented lifestyles, there simply isn’t enough space beside any station to handle riders arriving by car at demand volumes beyond an am peak inbound. This is the problem GO faces in trying to move beyond a commuter peak into downtown. Maybe on average, but depending on the station design at Lawrence East the availability of the hydro corridor and the local road system it is likely that reasonable accommodation can be made for those arriving by car. Bill R says The current RT frequency is 4-5 minutes, it is single TTC fare and it has a safe convenient transfer from bus to RT. SmartTrack requires a $1.50 fare increase, has far less frequency and a far more encumbered transfer path. The problem with the RT is that its main purpose is to go to an old mall and create a forced bus transfer that can easily be replaced by the Eglinton east LRT. Fundamentally the RT provides little to no value for the average trip. Unlike the RT the purpose of the RER station at Lawrence East is to ensure that people have proper access to quality employment opportunities. That is why it is important to design it so that it will overcome the objections that you have raised. Bill R says The record shows that the SmartTrack team did not honour any of their objectives – integrated fare, useful frequency of train service, viable replacement of the RT station, incorporate public feedback and even failed to provide modeling statistics based on 6-10 minute service and a incremental fare of $1.50. We should not misconstrue the performance of the SmartTrack team with the inherent viability of the Lawrence East Station. Jon Johnson said: We should not misconstrue the performance of the SmartTrack team with the inherent viability of the Lawrence East Station. Bill R said: The record shows that the SmartTrack team did not honour any of their objectives …viable replacement of the RT station, incorporate public feedback. At every public meeting, these issues have been raised and are documented in the TPAP file. The design is by Metrolinx and City Planners and TTC approve the design. Metrolinx is not accountable to the public and do what they like. The TTC is missing in action. City Planners are pressured by the political climate of the Mayor. The City paid Metrolinx a fixed price contract for 6 stations, including Lawrence. The King St. station has taken a disproportionate amount of the budget. The original Lawrence design was high cost. The current design is the cheapest possible to meet functionality. Steve: Strictly speaking the City has not paid yet as the final design costs have not come to Council for approval. However, the effect is the same. Liberty Village Station eats up a fortune, and everyone else gets second best. Another example of stupid political interference is the political requirement that the RT stay in service until the SSE is completed. The Ontario government had proposed to build a two stop subway extension and pay for it. The TTC pointed out that the project cost did not include the cost of the shuttle buses required when the RT was shut down to build the subway. Politicians believe the cost of the shuttle buses to be so important, that they required the RT to be in service during the construction of the SSE. Steve: The idea of shuttle buses was central to the anti-LRT argument, and if ST would have triggered the same change, this would blow a gaping hope in the subway boosters’ claims. Because the Mayor’s office has the power, City Planners did not point out that this interferes with the ST schedule and certainly complicates the design of the Lawrence station. The ST budget needs to be increased to improve the Lawrence station design. This is totally Tory’s decision. He could increase the ST budget or accept shuttle buses for the RT closure for more design flexibility and absorb the cost. We have yet to meet a politician who has transit expertise, yet political interference clearly increases the cost and hampers the benefits of transit projects.